Alice Zawadzki, Shirley Smart, Alex Roth at the Colaboración Fiesta at Home, Manchester. On a cold wet night in Manchester under a marquee these three incredible musicians created something special; beautiful open music delivered with passion, flair, wit and subtlety. Alice repeated this gig at The Lescar, with a slightly altered line-up that featured Misha Mullov-Abbado, which was equally wonderful. Richard Iles with Jamie Taylor, Eryl Roberts, Garry Jackson at The Lescar. 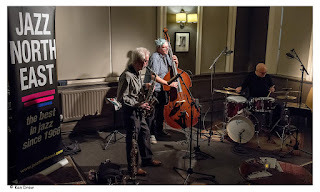 Four stars of the Northern jazz scene, all of whom deserve wider recognition, with a night that was special for all sorts of reasons, some very personal. Honest, swinging, intimate and warm-hearted, and of course, a lovely atmosphere at The Lescar on a mid-summer evening. Anton Hunter’s Article XI and Cath Roberts Favourite Animals at The Lescar. 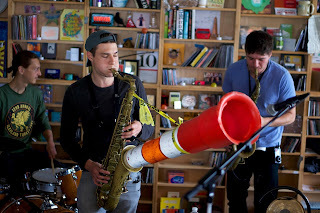 Two large bands playing creative, explorative music that was vibrant, original and also entirely accessible. A favourite for all sorts of reasons, again, but not least because of the reaction of the audience, including some of our best (but unprintable here) feedback, handed to me on a handwritten note during the second set, which really encapsulated the feeling of togetherness in the room created by a big, responsive audience and 15 wonderful musicians. Thoughout the year, I also immensely enjoyed three gigs at different venues given by Kit Downes, in the company of Tom Challenger (at the Hop Hideout beer shop in Sheffield, and also at Huddersfield Contemporary Music Festival) and also with Lauren Kinsella playing the music of Paul Motian at Manchester Jazz Festival. Two very special duos, I’m looking forward to hearing more of both in 2018. Best wishes to everyone for a wonderful and musical 2018. "Here is something from us! Best International Artist to visit the North goes to Kurt Elling - thanks to Ian Darrington and all at Wigan Jazz for putting it on. Best performance from an artist nearer to play Ilkley, goes to James Mainwaring, it was a real treat to hear his new original compositions from Ikigai. Mark Donlon, visiting from New Zealand, started 2017 with a very special trio gig featuring Leeds College of Music alumni Sam Gardner (drums), Matt Anderson (tenor) and Simon Read (bass). Mark played some of his own very poignant compositions about displacement and loss. We were delighted to have so many brilliant musicians offer to play for free at our very first ‘Refujazz’ mini-festival in February, curated by John Marley, which raised £2000 for refugee charities and was a wonderfully uplifting day of constant music throughout the afternoon and evening. Look out for the next Refujazz event on Feb 10th 2018! We celebrated International Women’s Day in March in style with the Alison Rayner Quintet, a wonderfully energetic band with a great sense of fun. 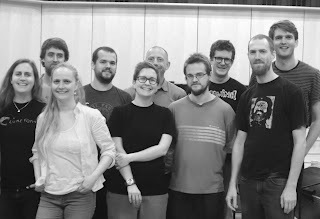 And we rounded off the summer season in June with Sam Watts bringing a whole sextet to play his original score for a screening of the Charlie Chaplin film ‘The Kid’! An amazing achievement and one we hope he’ll repeat soon. 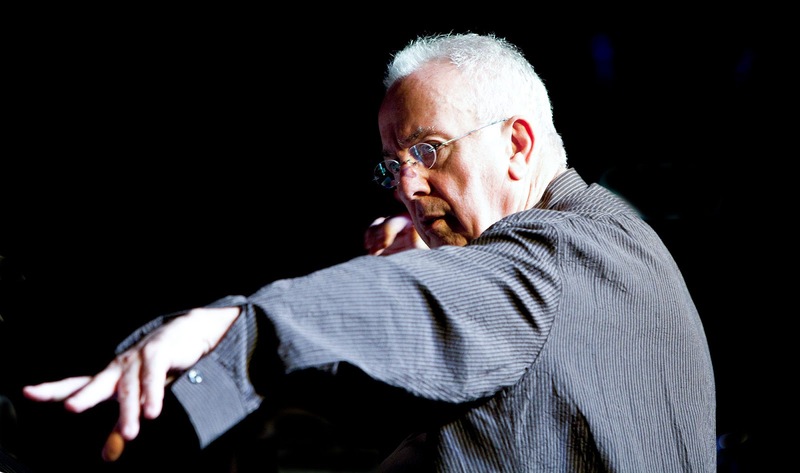 A tremendous highlight at the Scarborough Jazz Festival in September was the premier of Mike Gibbs’ 80th birthday celebration with the Hans Koller 17 Piece Big Band. The band read like a Who’s Who of jazz stars and it was a fitting finale to a great festival. I feel I have to include another 80th celebration (mine!) in May at Scarborough Jazz. The Alan Barnes/Dave Newton Quartet which included bassist Dave Green and drummer Sebastian De Krom gave a joyful and very special evening. And finally the Christine Tobin Trio had a deserved rapturous reception at Scarborough Jazz in November. Christine’s unique rich voice was brilliantly backed by guitarist Phil Robson and bassist Dave Whitford. All in all we had a fantastic jazz year by the sea. Quite a year in Leeds. I've never seen so much jazz activity and creativity going on. The city now over 20 live jazz venues with three supported by Leeds College of Music alone and jazz being played in all sorts of unusual venues. Unexpected things are happening too - the revival of interest in jazz vinyl has meant more interest in Jazz Dj's; the popularity of lindhopping is also helping increase support for traditional jazz in the city. The growing number of jazz instrumental workshops rehearsal big bands and vocal choirs is evidence of the vibrancy of jazz at a community level. All this and the formation of "JazzLeeds" in 2017- a new charity to promote jazz and jazz festivals in the city. It was not all good news though by any means for Leeds- the decision of the European Commission to ditch the UK element of the 2023 capital of culture programme meant a lot of work (and co operation) on the Leeds bid coming to a halt - hopefully not to be wasted. So which three events to mention? The first was the welcome back to Seven Jazz for stunning New York based saxophonist/composer Seamus Blake with Ross Stanley Hammond Organ, James Maddren drums. Recorded at Seven Arts in Leeds by BBC Radio "Jazz Now" in February. 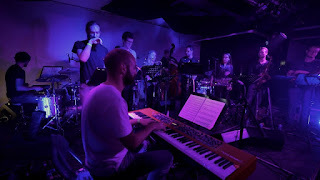 Lots of others too ran it close in particular a solo performance by Jason Rebello in May and a totally unexpected trio of Matt Robinson, Matthew Herd and Will Glaser in July.. Seeing the premiere of Issie Barratt’s "Interchange" at the Scarborough Jazz Festival was special too- Yazz Ahmed was on trumpet, Helena Kay on alto, Tori Freestone flute & violin, Maddie Dowdeswell trombone, Shirley Smart cello, Nikki Iles on accordion Charlie Pyne on double bass Katie Patterson drums and Brigitte Beraha vocals - a totally engaging performance in September. Two of these "best of" gigs are also thanks to the promotional acumen of trumpeter Kim Macari so special thanks to her. Here's to an even better 2018! At Hull Jazz Festival we encountered Moon Hooch a power trio from Brooklyn produced more energy than any band that I have ever seen. One set, in fact one number of 90 minutes long that had the packed audience dancing all night long. And finally, with an eye for the future, the wonderful Tomorrow’s Warriors led a truly inspirational project celebrating Jazz 100 with 6 local Hull schools and 2 youth jazz orchestras called Jazz Ticket with such great educators as Peter Edwards, Dennis Rollins, Binker, Sarah Tandy – what a great experience for the 100 young folk who took part! "Our most unusual highlight was a performance of solo improvised music in the Standedge Canal Tunnel by Norwegian cellist Maja Bugge. The Standedge tunnel is, at over 3 miles long, the longest, highest, deepest canal tunnel in Great Britain and is just a mile from the centre of Marsden. 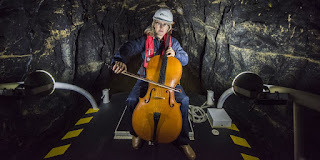 Audience members were brought into the tunnel on two electric boats while Maja performed in an adit (cross passage) between the canal tunnel and one of the disused railway tunnels running parallel to the canal tunnel. This event generated significant media interest and was featured on ITV News, on the front page of the Yorkshire Post and in the Sunday Telegraph. 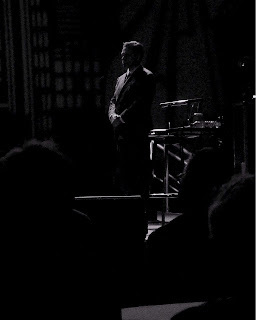 We commissioned Alexander Bone and Toby Comeau to create an electronic dance music-inspired suite for sextet, which was performed as an hour long continuous piece of music at the festival and subsequently broadcast on Jazz Now on BBC Radio 3. 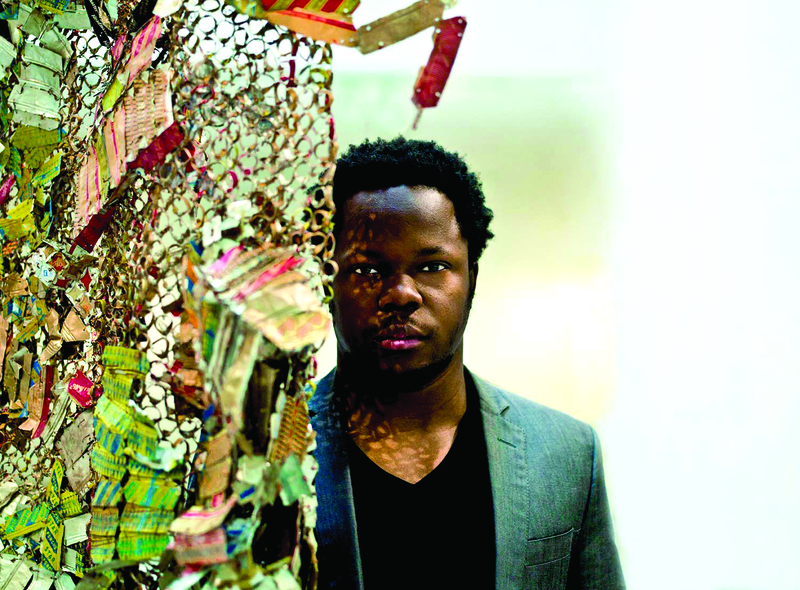 Presenter Soweto Kinch described Marsden as “One of the UK's most adventurous jazz festivals”. • with Match&Fuse - a pan-European network of promoters, resulting in an extraordinary triple-bill gig of bands from Belgium (De Beren Gieren), UK (Skeltr) and France (CHROMB!). Happy New Year and all the best for a great 2018. "What, only three? I’m not sure how many gigs I attended across the year, and, being averse to nostalgic rumination, I’m certainly not going to dig through my diary, but when you include double and triple bills I reckon I must have seen in the region of 70 bands, a high proportion of them completely new to me (at least in live performance). 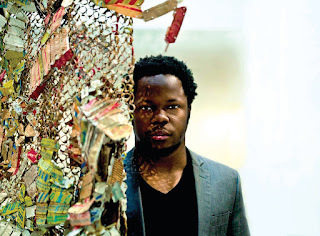 It’s an encouraging comment on the thriving state - creatively, if not commercially - of today’s jazz scene that very few of them were complete duds, and most in fact delivered a high quota of excitement. So a ‘best of’ contribution could almost consist of a long unannotated list with the message “Perm any three from 70”. But, being of an obliging nature, I have followed instructions, and pulled three from the bag of goodies, rather in the way that raffle tickets get chosen at Jazz North East gigs (and almost as serendipitously) . . .
* Going Dutch : this all-day event kicked off Jazz North East’s 2017 programme with nine outstanding musicians from the Netherlands and two from the UK, mixed and matched in a dozen shortish sets that alternated between established groups and new, ad hoc combinations, with approaches that ranged from immensely subtle chamber music to paint-stripping ferocity. 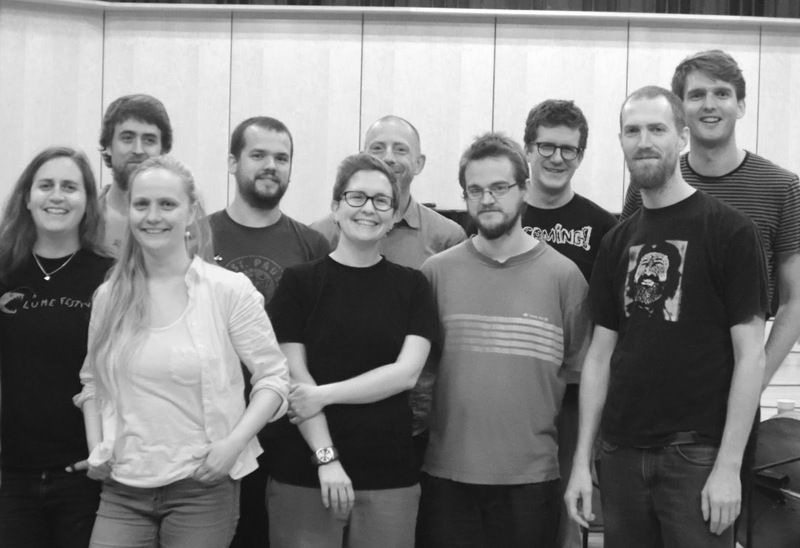 What was particularly intriguing and rewarding was to experience the ways in which the new generation of young Dutch improvisers has found its own voice while retaining the tradition of mixing freedom and fun established by their predecessors. A fine antidote to Brexit. * Newcastle Festival of Jazz & Improvised Music : an extraordinary achievement from my friend and colleague Wesley Stephenson, who in the space of 12 months translated the idea of resurrecting the Newcastle Jazz Festival (defunct since 1995) into glorious reality. By getting all of Tyneside’s promoters and venues to collaborate, and winning Arts Council funding to bring in high profile artists, he put together a programme of eleven events, involving close to 50 local, national and international musicians. The cowardly populism that blights all too many of today’s jazz festivals was avoided - indeed, several of the sessions were pretty challenging - but that didn’t have an adverse effect on audience numbers, with ‘House Full’ notices required even for uncompromising improv. A triumphant initiative that I certainly hope will now become a regular part of the calendar. * Biscoe, Pope & Turner : I heard many superb free jazz & improv gigs over the year, some with such internationally acclaimed artists as Ingrid Laubrock (her wonderful ‘Sleepthief’ trio) and Evan Parker - teamed up with Mat Maneri and Lucian Ban. But I’ve picked out the trio of Chris Biscoe, John Pope and Roger Turner because I think it illustrates just how creatively welcoming and stimulating free music continues to be. 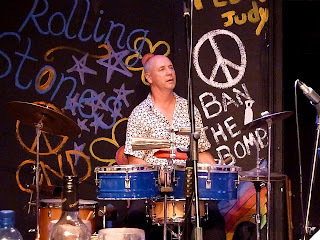 Percussionist Turner is now one of the elder statesmen of the scene (although, like so many of his contemporaries, better appreciated overseas than here in his native country), and the more melodically inclined reedsman Biscoe is a much loved figure for his many decades of work with Mike Westbrook and others. But young bassist Pope is just beginning to attract attention outside his Tyneside base, and on the evidence of this gig is more than able to mix it with the big boys. The trio’s only previous encounter was four years ago, at which time John was clearly the junior partner, slightly overawed at finding himself in such august company - but this December reunion was indisputably a meeting of (equal) minds, and a great way to see me into 2018 with an optimistic spirit. So there you are, just three snapshots from a tremendous year. I’m tempted to append a list of also-rans, but I’ll resist the inclination. I can look back on the whole panoply of 2017 with pleasure, but what I really enjoy is looking forward: my answer to the question “What is you favourite gig?” is invariably “The next one”! Barry Green's New York Trio at Crucible Studio for Sheffield Jazz on 3 February 2017: : a great (but nonetheless criminally underrated) British pianist in company with two of the leading lights of the US jazz scene and producing really beautiful interactive music which mesmerised the audience. Tony Kofi Quartet at Crookes Social Club for Sheffield Jazz (31 March): A brilliant quartet (Kofi/Wallen/Bartley/Youngs) playing some very challenging Ornette Coleman material and demonstrating just how entertaining and accessible it can be. 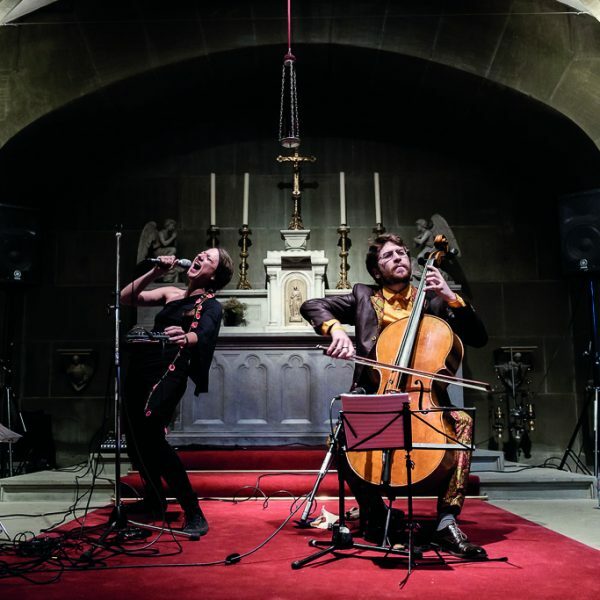 Leila Martial and Valentin Ceccaldi at St Ann's Church for Manchester Jazz Festival on 1 August: : an absolute revelation. a truly superb and original vocalist and a very fine and versatile cellist using the unique atmosphere of this fine church to produce a spellbinding set." Jazz Honours list from Ribble Valley..
2017 created some challenging, creative & memorable experiences for Ribble Valley Jazz & Blues. Three experiences stand out as ones that confirmed priorities, and ones that could be influential in 2018. 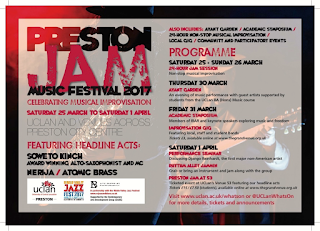 RVJ&B’s 1st 2017 memorable experience was the final session of Preston Jam festival on 1st April, completed with stirring performances from all-women septet, Nérija, and Soweto Kinch Trio. Ribble Valley Jazz & Blues was commissioned by UCLan - (the University of Central Lancashire) - to curate the university’s first jazz festival whilst agreeing to become RVJ&B’s first major festival sponsor. Having UCLan’s logo on the front page of RVJ&B’s 2017 festival brochure increases our festival’s credibility. The 2018 UCLan festival, renamed Preston Jazz & Improvisation Festival takes place 7/9th June. UCLan is confirmed as RVJ&B annual festival sponsor. UCLan’s support, along with year two Arts Council England G4A funding for our May Day Bank Holiday Festival 2017, helped deliver RVJ&B’s 2nd most memorable experience, which was the appointment of young band Jam Experiment as our festival’s Band-in-Residence. 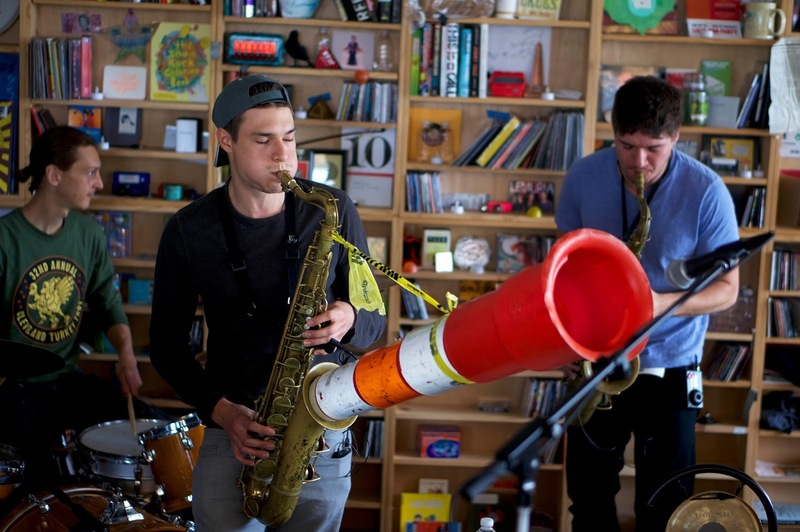 Has any other festival been able to commit to a young Band-in-Residence? Jam Experiment excelled in their four day festival commitment with a fine performance on stage, along with Alexandra Ridout Quintet, and the Lancashire Youth Jazz Orchestra on Festival Saturday afternoon, 29th April - a memorable experience that hosted two BBC Youth Jazz award winners - Alex Bone and Alexandra Ridout, a future Rising Star award winner in 2017 British Jazz Awards - Rory Ingham, whilst enabling RVJ&B to more than meet its commitment to prioritising music by young jazzers. Completing the set of three memorable experiences was the first of RVJ&B’s first regular Jazz Jams in February 2017 in the Bowland Beerhall at Holmes Mill, Clitheroe, an amazing new venue, and £10m redevelopment enterprise that claims the longest bar in the UK serving its own real ales, serves good food, and hosts RVJ&B’s monthly Jazz Jam on the 3rd Thursday monthly. On the back of the Jazz Jam, Holmes Mill became a major business sector sponsor of our May Day Festival, supporting the costs of two outdoor stages on Festival Sunday & Monday, and the monthly Jazz Jam session continues into 2018 with 15/20 local and regional, mainly amateur musicians turning out, supported by a pro trio. And Homes Mill festival sponsorship continues into 2018! It's almost the end of 2017 and so its that time of year again where I've asked people involved in the jazz promotion in the north for their three most memorable events of the year just gone in our New Year’s Northern Jazz Honours lists. These will be posted on the Northern Jazz Live blog in the next couple of days - send yours in to me at crockersteve@ntlworld.com!. "My 3 New Year’s Northern Jazz Honours. Our mjf highlight this year was the Irwin Mitchell mjf originals commission: ‘Cottonopolis’, Andy Stamatakis Brown’s energetic tribute to the Madchester scene of the late ’80s and ’90s, which transformed a disused mill building in north Manchester into something of a jazz rave for the evening. I was impressed and so pleased for Andy that he pulled this off with incredible energy and dedication, honouring his affection for both the jazz tradition and the city’s dance culture, and integrating the sound and visuals of its cotton heritage so meaningfully. The 5* reviews were well-deserved. Although there was a disappointing awareness shown of the northern sector in this year’s Jazz FM and APPJAG Awards, hats off to Mike Gordon for the acknowledgement of Scarborough Jazz Festival on the occasion of its 15th anniversary. Keeping the magic going year after year and getting the programme on sale as early as SJF do is an achievement to which we all aspire! My third ‘honour’ is a little abstract, but there’s been a marked step change in funders having a presence in the north this year – despite what it may seem to those outside of the funded sector. Help Musicians UK and PRS Foundation hosted national conferences here, several northern partners received funding awards (Lancaster Jazz Festival, Sage Gateshead), and there was an increase in investment in arts organisations across the board in the summer NPO announcement. I think this is a positive behind-the-scenes step towards more geographical balance, so let’s mark that small achievement in the hope that it triggers further forward momentum. But there’s still, of course, a long, long way to go before there’s a genuine balance of investment in culture per head of population for all of us here in the north." Got a hangover? Common on, shape up! Okay, it’s January 1st but there’s a jazz gig to go to in the North East. The Bernicia Jazz Trio play the Half Moon Inn in Choppington, Northumberland at three o’clock and it’s free admission. Getting out to a jazz gig is the best known ‘hair of the dog’ cure there is. Just think, there’s a further three hundred and sixty four days and nights to get out and about to listen to some jazz. Start as you mean to go on! So, January begins in small scale fashion with a trio in a semi-rural pub but the month closes with a rather more grand affair with a staging of Will Todd’s Mass in Blue in Durham Cathedral (Jan 27th). The Will Todd Jazz Quartet will be performing alongside Durham Choral Society in a concert which is part of the Durham Vocal Festival. In between times there is plenty of top class jazz including an all day celebration of the Luxembourg jazz scene (Jan 21), a Chris Sharkey workshop performance (Jan 24) and two final tour dates for an emerging guitar-led quartet. 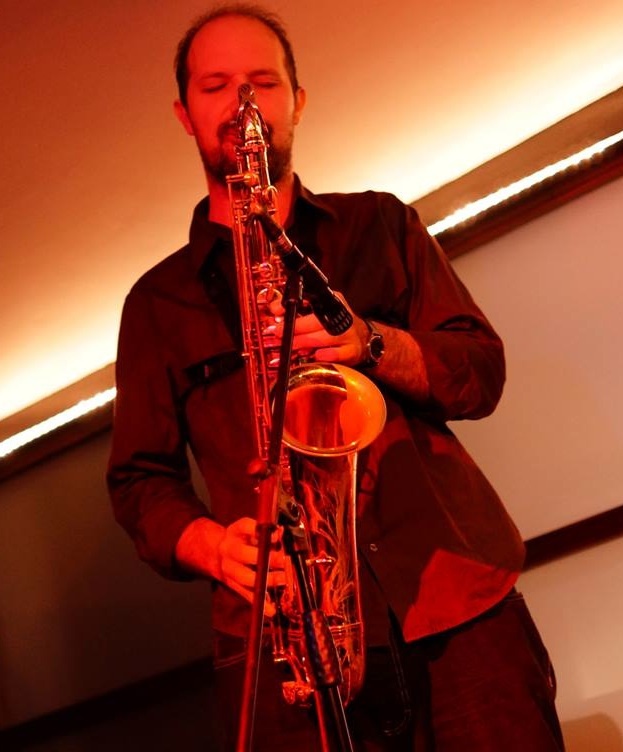 Jazz North East’s promotion at Newcastle’s Lit and Phil – Jazz de Luxe – presents a day-long, two-part programme of concert sets by musicians from Luxembourg’s contemporary jazz scene and Tyneside trio Archipelago. Guitarist Chris Sharkey will be at Newcastle’s Jazz Café in the first of two open workshops during which the Gateshead-born improviser will preview, and further develop, work which will be premiered at this year’s Gateshead International Jazz Festival (April 6-8th). 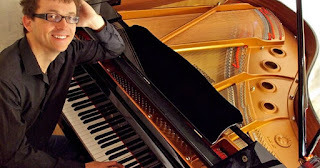 On this occasion Sharkey will be working with Leeds based pianist Matthew Bourne. It is anticipated that Sharkey will forsake playing his Stratocaster in favour of developing an experimental, electronic soundscape. Francis Tulip will most certainly be playing his Gibson guitar at Hexham’s Fox Inn (Jan 9) and Darlington’s Quakerhouse (Jan 14), the remaining two dates of a festive tour of north east venues. Tulip, studying at Birmingham Conservatoire, will be working alongside pianist Joel Brown, Guildhall undergraduate bassist Michael Dunlop and Matt MacKellar, a hugely talented drummer currently studying at Berklee. 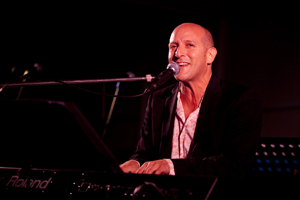 Pianist Paul Edis crops up on at least three occasions during the month – first, with his own trio at Saltburn Jazz Club (Jan 5), a week later (Jan 12) as part of Triptych at the Jazz Café, and exactly seven days on he will be returning to the Pink Lane venue with the Graeme Wilson Quartet. Sage Gateshead offers little jazz in the early part of the year but one concert which will be well attended is Ray McVay’s return with his UK Glenn Miller Orchestra. A nostalgia trip perhaps, but be assured that within its sections the band boasts many ‘been-there-done-that’ jazz musicians. The Sunday matinee performance (Jan 14) is selling fast. To check ticket availability telephone 0191 443 4666. 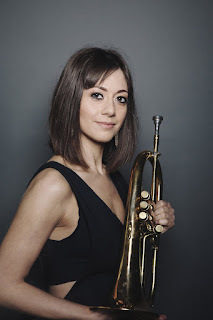 Finally, violinist Emma Fisk is out and about, first with her Hot Club du Nord (Jan 12) at St Mary’s Parish Hall in Barnard Castle, then on Jan 19 she plays a lunchtime duo gig with guitarist James Birkett at Bishop Auckland Town Hall playing the music of Joe Venuti and Eddie Lang. 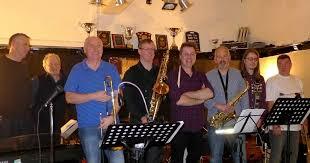 Ribble Valley Jazz & Blues anticipates another year full of interesting jazzy events and initiatives. Trish Ferrarin’s Breaking Jazz starts the new year in Sawley at the Spread Eagle Hotel’s dinner jazz gig, at 2-4pm Sunday 7th January. Our local partners, The Grand Venue, Clitheroe, hosts two top UK musicians with Zara McFarlane performing on Saturday 10th February, and Courtney Pine & the Inner City Ensemble appearing on Saturday 24th February. Advance booking for gigs at The Atrium and The Grand Venue is advisable via The Grand Venue’s web site - thegrandvenue.org.uk or from Box Office, 01200 421599 - More info from geoff@rvjazzandblues.co,.uk 07870 908159. Jeremy presents a very special one off night as he re-unites his old partnerships with Paul Bentley on vocals and Ben Gray on drums together with current ones Richard Hammond, bass and Steve Parry, trumpet. This legendary line up, which last performed in 2009 had a huge local following in the North West, so we expect a massive response. Jeremy and Paul will both be singing from their classic swing, blues, soul and groove repertoire, but who will be cracking the jokes between the songs? Book your table to find out. It will be quite a night! Nearly full circle! jazz@davenham has just started its’ 7th year under “new management”. When we “re-started” jazz@davenham just over 6 years ago, Andy Scott was keen to see live jazz continue at Davenham theatre, and was partly responsible for helping us set up the first few gigs, and indeed Dave Hassell and Andy were amongst the first few bands to appear. We asked Dave Hassell to bring in a band for January and it is his idea feature Andy Scott. Dave Hassell is a professional musician with over 49 years' experience as a studio session player, live performer, band leader, author and adjunct faculty of the leading music institutions in the UK. He has performed with many of the UK's leading jazz musicians as well as American greats, such as: Dr John, Tal Farlow, Clarke Terry, Art Farmer, to name just a few. The concert will be in duo, trio and quintet format with Dave on percussion, Andy on Sax, Carl Raven on Clarinet / Bass Clarinet, Nick Svarc on Guitar and Matt Owens on Double Bass. "This band is about enjoyment for performers and audience alike - the perfect antidote to the po-faced gloom school of jazz!" says Alan Barnes. Saxophonist Trish Clowes returns with her new group project, My Iris, drawing inspiration from the concept of an iris opening and the kaleidoscopic range of sounds which the band are exploring. Gilad’s fiery, impassioned style and brilliant musicianship regularly attracts packed houses in Sheffield. 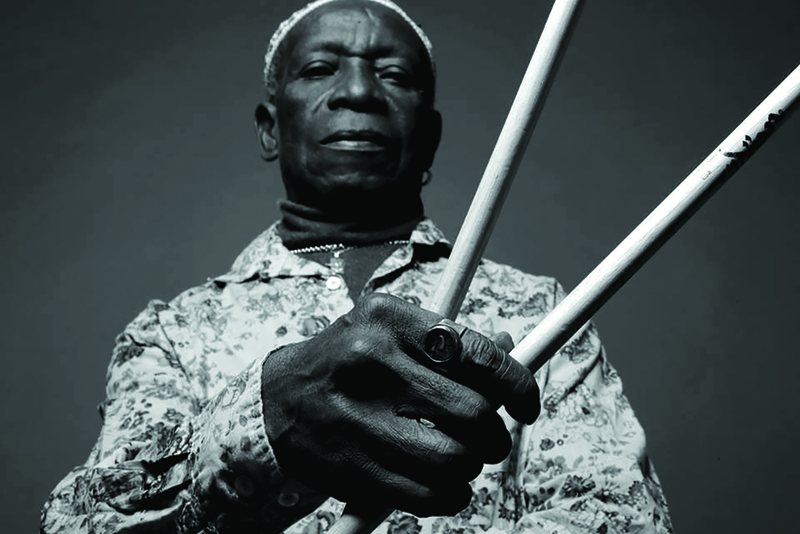 Touring for over 17 years, the band have gained a reputation as one of European jazz’s pre-eminent bands. The "Jump Monk" project is dedicated to performing the music of two of the greatest jazz composers and musicians: pianist Thelonious Monk and bass player Charles Mingus. The word is out on Rob Luft: hotly tipped by The Times to “achieve great things”, the award-winning guitarist brings to Crookes the great young band with whom he made his debut CD “Riser”. Tipped as a rising star by Jazzwise and Time Out magazines, Yazz Ahmed’s 2017 album “La Saboteuse” has been widely judged to be UK jazz album of the year, blending western and Middle Eastern influences. 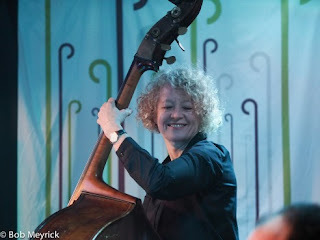 Nikki Iles is a real favourite of Sheffield Jazz audiences and this is a brand new quintet which was formed for the Manchester Jazz Festival in July 2017. Crookes Social Club, Sheffield S10 1TD. Crucible Studio, Tudor Square, Sheffield S1 1DA. More details about all these gigs in Sheffield Jazz’s season at: www.sheffieldjazz.org. Jazz party with live band and jam session. It's party time! What better way to spend the last Sunday night before the Christmas / New Year break? There will be live jazz from 6pm till late in the main bar at the Globe. We have more jazz before the end of the year including vocal showcase Indigo Jazz Voices on 19 December and the famous jam session Take It To The Bridge on 20 December. Accessible original music from 3 of Europe’s finest young jazz musicians: Alan Benzie Trio on Thursday 22 Feb 2018. Internationally acclaimed contemporary piano trio Dominic J Marshall Dutch Trio on Thursday 29 March 2018. Groove-based sax/guitar/organ/drums quartet, Teduloca on Sunday 22 April 2018. The lyrical, international jazz of the Brian Molley Quartet on Saturday 2 June 2018. SevenJazz finishes - JazzLeeds takes over! 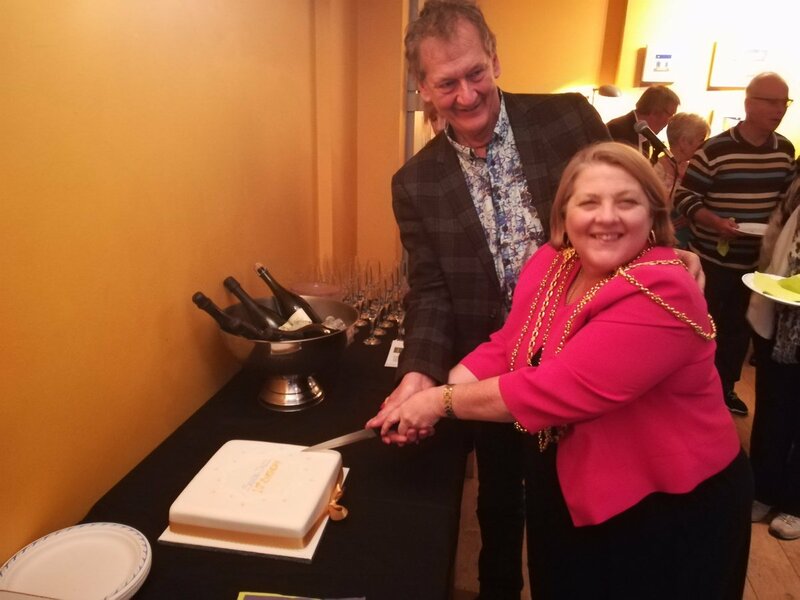 The Lord Mayor, Cllr Jane Dowson was the special guest at the JazzLeeds launch party held on Sunday afternoon 10 December at Seven Arts Chapel Allerton Leeds. Cllr Dowson also be announced the setting up of a new charitable organisation JazzLeeds, to support the development of jazz in the city in the future and provide a lasting legacy for the superb jazz history of Leeds. The concert on Sunday at Seven Arts also included fundraising raffle for the Lord Mayor’s charity appeal – Candlelighters, the children’s cancer charity based in Leeds who support families facing children’s cancer across Yorkshire. 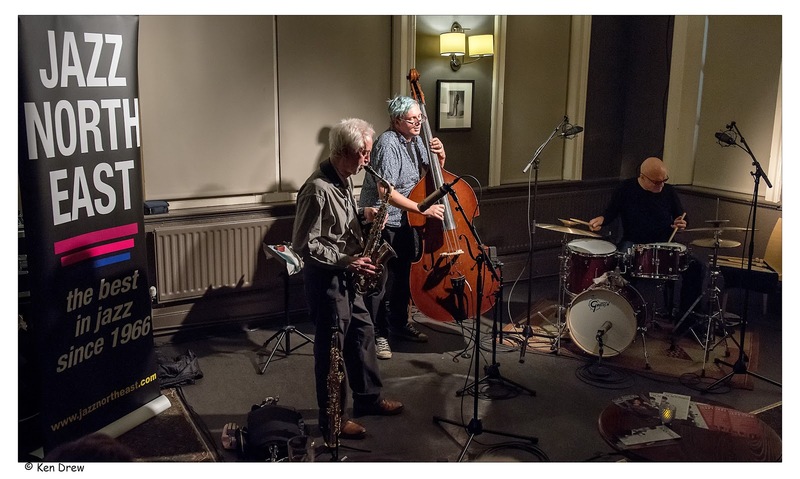 “It has been a brilliant ten years for us in Leeds with the highlight undoubtedly being named as the UK’s best jazz club in the Parliamentary Jazz award. Leeds is such a buzzing jazz city and there are great things to come from the new JazzLeeds organisation. But getting the Lord Mayor of Leeds to a jazz gig was just icing on the cake – and a very nice cake it was too! It’s that time of year again and the Jazz North organisation has now opened the application portal to recruit the next round of northern artists for Round 6 of the Northern Line scheme. Since its launch in 2013, northern line has featured 58 Ambassador Artists who have performed over 550 gigs with approximately 150 promoters and partners across the north of England and beyond. As in previous years, northern line Round 6 will be selected by an independent panel of musicians, promoters and industry experts. Artists selected for the scheme will benefit from subsidised performance fees, on-going professional development support and will perform at our showcase day at Manchester Jazz Festival in July 2018. It is very important to us that the Northern Line roster represents the diversity of our region and we are looking to raise awareness and encourage applications from northern based artists who may not ordinarily be aware of the scheme. We are particularly keen to receive applications from talented women and musicians from diverse ethnic backgrounds, both of whom are woefully underrepresented in the jazz sector.